Located not far from a "V" shaped bend in the Colorado River almost exactly halfway between The City of San Saba and The City of Lampasas on Hwy 580. The biggest structure in the area is the bridge connecting the two counties of San Saba and Lampasas. The river is cool, shallow and access is available on the Lampasas side for a mere three dollars a day. This enterprise could provide better signage. Enter first driveway past the bridge on the Lampasas side. A little native stone cube, now overgrown with vines had been the Bend Post Office. It's now across the river. Also on the San Saba side are two monuments. One to veterans who have died overseas, and the other to a local doctor. The men listed on the memorial died in France, India, Saipan, Okinawa and Camp Bowie. Places far flung from such a tranquil spot. The doctor was Edward Doss. His marker shows a photo of the Doctor with his Horse "Old Ross" and the carriage in which Ross pulled Doss. After Ross died, the doctor wore out three automobiles in making his rounds and emergencies. He came to the area in 1882 with his wife Arebell and crossed the river uncountable times in every season, day or night. He treated local residents until his death in 1928. 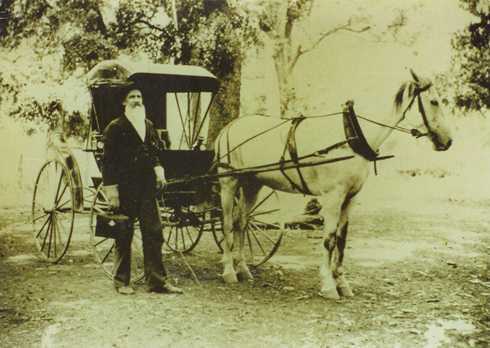 Dr. Edward Doss, his buggy, and his horse, Old Ross. "In this account of the history of Bend, Texas, it may sound like that my ancestors invented the earth, inhabited it, created Bend, Texas, and hung the moon. It is not my intention to leave that impression, but I can only write what I have heard and learned of them. There are many other pioneer families that contributed to the history of Bend. I will list some of them but I know that I will leave out some. Early family names in the Bend area other than my relatives are: Baxter, Smith, Millican, Cate, Turner, Gibson, Gorman, Marley, Morris, January, Buckhannan, Bearden, Matsler, Byrd, Scott, Lewis, Barefoot, and many more ... next page "
For a summer get-away, a trip to Bend including the under-visited towns of Lampasas and San Saba might just be what Doctor Doss would've ordered. "..Colorado Bend is pure Hill Country: stands of live oak and juniper, thick with wildflowers in the spring, whitetail deer all year long and, every spring, the white bass moving up the Colorado River to spawn..."
"Two former Texans also died in the infamous disaster -- James H. Bracken and Alfred Rowe. Bracken had lived for a time near Bend, a small town on the Colorado River in San Saba County. Rowe owned a large ranch near Clarendon in Donley County. 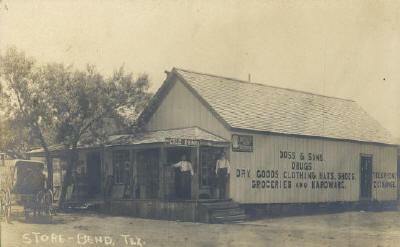 Bracken, born in Kentucky in 1881, gained his Texas connection in marrying San Saba county native Addie Greathouse in 1907. Later they moved from Bend to New Mexico, and it was from there that he left for England on a cattle-buying trip. On his way home as a second-class passenger when the ship sank, his body was never identified." Dear Editor: I am a physician practicing at _____. I am a family practitioner by training. Several years ago, when I was nearing a burn-out point in my career, I took my family for a camping holiday in Texas. One of the places we camped was at Colorado Bend State Park, and we had a wonderful time. We went to the small country store outside the entrance to the park in Bend, and I noticed a monument across the road. I went over to take a look. As I read the inscription, I started to get a lump in my throat. And then I shed a few tears. The monument was erected in the memory of Dr. Edward Doss, a pioneer physician. The monument has a photograph of Dr. Doss and his horse, gives a brief description of his life, and has a poetic quote at the end: "No night too dark or road too long to serve his fellow man". Discovering this, completely by surprise, was, and still is, an emotional experience for me.